"Baby, things happen. I can't take 'em back." The Coen brothers have such a distinctive voice that you wouldn't think that they'd be well suited, or interested, in adapting films from someone else's source material�their halfhearted remake of The Ladykillers seemed to bear that out, and you got the sense from the title card on O Brother Where Art Thou? ("Based on The Odyssey, by Homer") that they think that the notion of adaptation is absurd, or just some sort of stupid joke. So one of the many things that's kind of stunning about No Country for Old Men is how they take the work of an established, well-regarded novelist and make it their own, while remaining respectful of their source material. Cormac McCarthy hadn't been especially well served by the movies in the past�the film of his book All The Pretty Horses got at the pretentiousness that can occasionally be part of McCarthy's writing, but little of the passion. With No Country, though, he's telling a pulpier tale, one frankly more suited for the movies�and he's been blessed with a couple of worthy co-conspirators. Strip away the stream of consciousness and the deep debt to Hemingway, and what you've got in McCarthy's book is a classic movie pitch: a drug deal gone bad, with a suitcase full of cash and a pickup bed loaded with bricks of cocaine. Josh Brolin plays Llewelyn, a laconic, unsuspecting sort who stumbles upon the carnage�a remote desert location strewn with dead bodies and bullet shells and money and coke, and he figures he'll make off with just the third item on that list, $2 million in a satchel. Of course a clean getaway is out of the question, and someone is looking for that money�and an especially terrifying someone at that. Javier Bardem plays Anton Chigurh, whose laconic manner, dead shark stare, relentless pursuit of his money, unusual choice of weaponry, and deeply unfortunate haircut make for a frightening, uncompromising, amoral villain for the piece. Bardem earns all the praise that's been heaped on him for the performance, which creates menace in pretty much every frame of the movie; and Brolin is a revelation as well, giving a multidimensional portrait of a fellow who has learned to keep his own counsel. There's no denying a sadistic streak that runs through a lot of the Coens' work, and at times they seem to cross over into misanthropy; there's some of that here, along with an odd focus on animals, who recur with surprising frequency. But it's such a pleasure to watch a film that's respectful of its audience, that trusts us to hold on to ideas and information, that lets us make up our own minds�and on some level it's a deeply conventional genre piece, as close as the brothers will ever come, I'd wager, to making a serial-murderer movie. There's almost no music on the soundtrack, but we don't need that sort of telegraphing here; and as usual they get exemplary work from cinematographer Roger Deakins, whose images communicate the arid landscape as keenly as they do the emotional desperation of the folks who populate it. It's a movie you can't shake easily, and you'll see Bardem's dark motionless stare in your nightmares. Image Transfer Review: Deakins' work is extremely well rendered on this disc, with little or no visual interference, and variations in saturation that are frequently exquisite. Audio Transfer Review: The arid style of the piece means that there's not much aural fanfare, but the transfer here is certainly an adequate and clean one. Extras Review: The same sets of interviews were used for the three accompanying making-of pieces, and you get the sense that the cast is game and used to this, even if their directorial tandem would rather be napping. 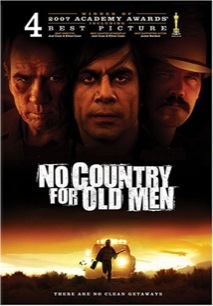 The Making of No Country for Old Men (24m:28s) is full of on-set interviews and clips, and emphasizes the genre and literary pedigree of the piece. The actors discuss the oddness of the Janus-like directing corps in Working with the Coens (8m:07s), and Jones is at the center of the Diary of a Country Sheriff (6m:43s). Not much to any of these, really. Everything seems sinister in this dark and carefully crafted film, which merits all the awards it has received, even if at heart it's a pulpy piece of work. It's unlikely to engender the crazed loyalty of some other Coen brothers pictures, but it's a creepy, unsettling ride nonetheless.